New Testament - I love that Paul calls Jesus the "Divine Yes" in today's readings in Second Corinthians chapter 1 verse 19 in the NLT! Here are verses 18 through 20 in the NIV - "But as surely as God is faithful, our message to you is not "Yes" and "No." For the Son of God, Jesus Christ, who was preached among you by me and Silas and Timothy, was not "Yes" and "No," but in him it has always been "Yes." 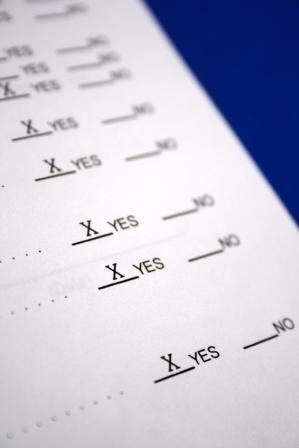 For no matter how many promises God has made, they are "Yes" in Christ." Amen! Do you realize that Jesus is the fulfillment of all of God's promises in the Old Testament? The Law pointed to Jesus in the OT and the Law is fulfilled in Jesus. The sacrificial system pointed to Jesus in the OT and the sacrificial is fulfilled in Jesus. Jesus is indeed the Divine Yes! In your life each and every day, is Jesus your Divine Yes? Psalms - Today we read in Psalm 41 verse 1 – “Blessed is he who has regard for the weak; the LORD delivers him in times of trouble.” For some reason this verse really opens up my heart. Something about the word “weak.” Maybe this verse really speaks to me because I myself feel weak at times. And yet, I am so blessed in so many ways. And I realize that there are so many others out there in this world who may not have the blessings that I have, and who are struggling through an extremely tough cycle of weakness. And I wonder – what am I doing to help those who are weak? Do I really have regard for the weak? Do you? What in our life really demonstrates that we have regard for the weak? Are we investing time or finances into the weak? Are we praying for the weak? Are we loving the weak? 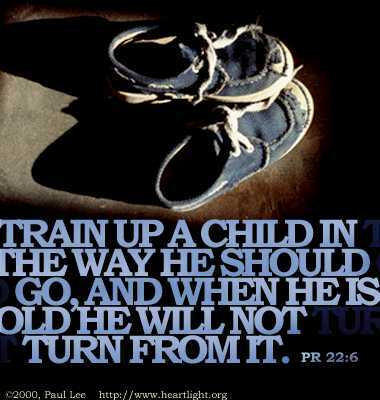 Proverbs - Proverbs 22 verse 6 today teaches us: "Teach your children to choose the right path, and when they are older, they will remain upon it." You know, this verse actually reminds me of quite a bit of recent work I've had the good fortune to participate in or observe when it comes to early childhood education. 85% of a child's brain develops in the first 3 years of their life. Think this is a critical period of time to teach children? Certainly after the age of 3 we still have so much opportunity to teach children to choose the right path. I am becoming more and more convinced that education for children is so critical here in our own backyards and throughout the world. And unfortunately, as we all know, quality education is not happening in many sectors of our society and our world. Let me encourage you to please invest in childhood education in your own backyard and around the world. Find a child to mentor. Teach a Sunday school class. Invest in nonprofits working on childhood education. Sponsor a child through World Vision where they will get a fantastic Christian education. Will you join me in personally getting involved with and investing in organizations that teach our children to choose the right path? Have you sung the Revelation Song to thee Lord? Click here and Sing! Prayer Point: Pray that you train your children in a godly manner. 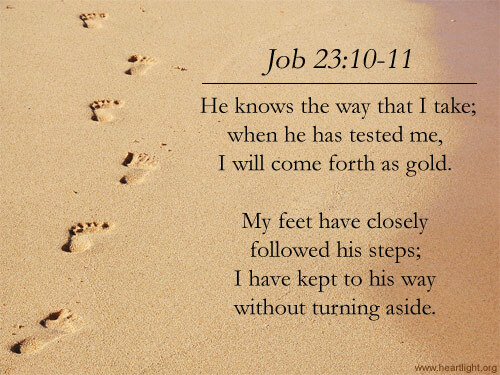 Pray that you, as a child of God, are living in the way you know you should go. Pray that you and your children will not turn from living a godly life. Now that I am reading Job using a different perspective, I see amongst his words and his “friend’s” words many things from a different view point. One of the things I see is this belief that when things are going badly for us, God must not be anywhere near. This kind of thinking is not held exclusively by Job all of us do it, believers and unbelievers. Things not going our way or how we think they should go then either we begin making a list of everything we feel guilty of; or, if we have truly repented of our sin and we are not operating out of “false” guilt, we question God’s justice for beating us up adding, “God if you only knew!” We think God is hiding from us because we just don’t understand what is going on. If we really stop and think and look at the process of refining silver and gold and or study how precious metals and minerals are formed in the earth, we would understand that everything valuable that God has created comes by way of seeking (Ask, Seek and Knock) pressure and/or heat. It takes heat to melt silver to skim off the dross; and even greater heat to purify gold. Diamonds are nothing but pieces of black dirty coal under a lot of pressure for a very long time. The value is increased; the beauty of the metal or mineral is enhanced by stress, lots of stress. Mike I love your food analogy in today’s comment on Job. If we, those who are believers in Jesus Christ really examined your questions we would think about why so many of us, and in some areas, most of us, are so focused on physical food and have no relationship with the Words of God and His Christ, the Bible. Let’s just get real: Ask the question, at least pertaining to the Church in the United States, “Why are there so many obese folk filling the church pews across the country?” It could give the appearance that many of us are not getting our comfort from the Word of God but from the plate, and not the collection plate, the dinner plate. About 12-18 months ago my pastor, before he began his message, read a letter from the manager of the local Red Lobster that asked him to speak to the congregation about their behavior. You see, after Sunday services (three serves 8am; 10:30am; 1pm) folks were going over to the restaurant and demanding to be seated ahead of everyone else already on the waiting list because they were CCC members. How rude, crude and totally not Christ like. Obviously, their physical bellies were not being controlled by what they just had been given spiritually. Christ like behavior is manifested through the Fruit of the Spirit—so, show me the fruit!